I was seriously doubting I would reach this point after last night. LOL I got all the binding down after getting my new foot. Dad called me that night and he said he was going stateside, so I called the area Joann stores, and made sure it was on hold for me. 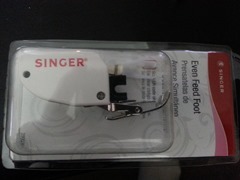 By 3pm yesterday I had my new Singer walking foot. And by God it bloody well worked!!! 30 mins later, I had the binding on and it was time to hand stitch down the binding – course I had to look up if I used single or double thread – *Shake my head* It’s currently in the dryer and I want to wait until daylight to get some better pictures and will post them tmrw before I go to yoga. 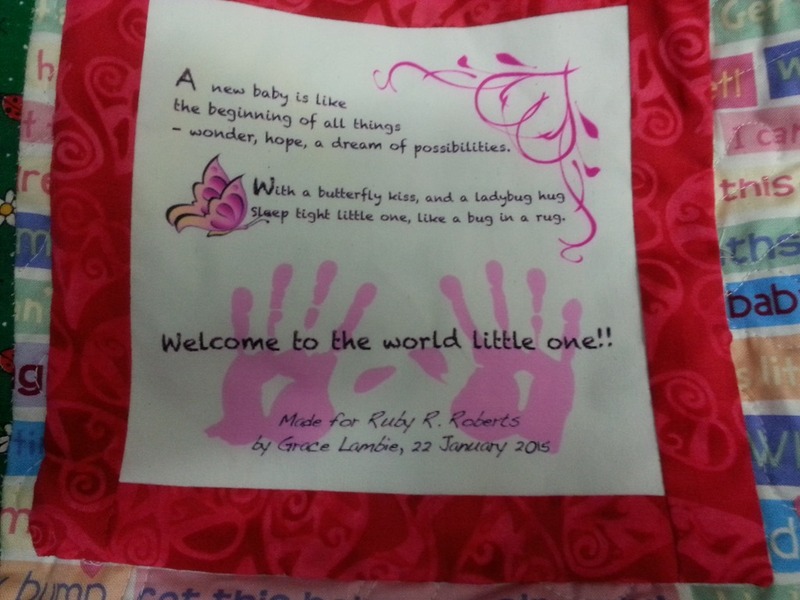 Oh and it’s still unnamed other than me calling it Ruby’s quilt. I got finished the hand binding by around 3am or so – maybe later and I decided to push through to put the label on – bad mistake – It shifted while I was sewing it on (silly me didn’t pin it down) so I had to frog stitch it and it became today’s task. First, you will choose a base color (white, black or gray) – this can be a solid, mottled, or tonal print. Next, choose a good contrasting color for this (ie: lime green, pink, dark red). Again, these can be solid, mottled or a tonal print. Finally, you will choose 6-12 Prints with lots of colors – large florals, fun colors will work with these. Merry Mayhem Case 128 Big Fan, Anilee Art Illusion, QT Summer Mystery Butterflies and Hopscotch and Quiltbug.com Square Deal. I loved doing these and I want to do another one along this style – something a wee bit different. I do love the way that 1/4 square triangles can be used to make some of the most dynamic and gorgeous quilts – my design for Kyle’s Spinners is based on 1/4 square triangles. I found this on pinterst earlier and just LOVE – Campsie. So I’ve a few options – but definitely need to delve into my stash and see what I’ve got.